Country or barn style homes are popular, and for good reason. They’re a wonderful way to bring an oasis of rustic charm to the city, a sea of concrete and metal. They can also capture the whimsy of another time and place. They’re even a great way to modernize and elevate an old, outdated barn or existing farmhouse in dire need of some TLC. 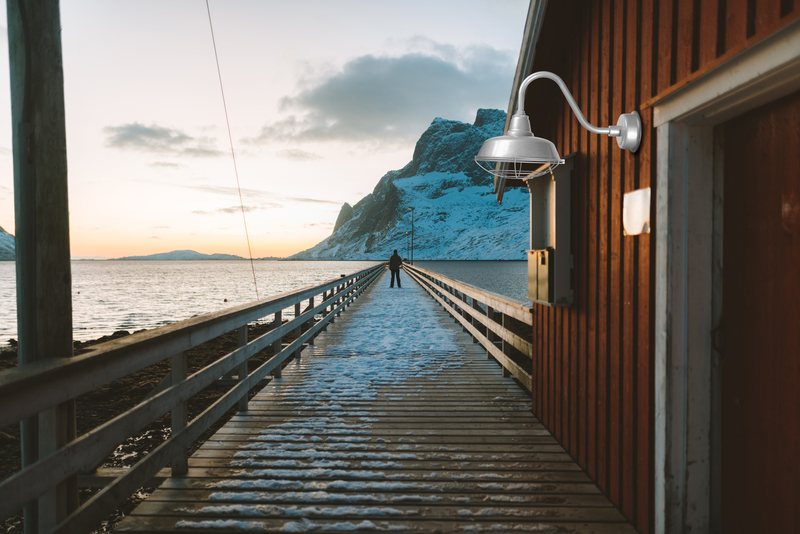 No matter your situation, barn lights are an integral part of the country or barn theme, and as with any design category, the devil’s in the details. That’s why we’ve compiled some country theme design ideas below, as well as tips on how best to make your barn lights work with your overall vision. Having an overall theme in mind might be an obvious step, but like with planning any major project, it’s important to have a goal. Without a goal, you’ll end up wasting precious time and money buying things you don’t need, or buying fixtures and colors that don’t match. Save yourself the trouble by having something in mind before even putting anything in your cart. Note that we didn’t suggest that you have something in mind before even setting foot in a store, because one of the wonderful things about home design is to be inspired by seeing and touching the materials and finishes you’ll eventually put in your home. This rings especially true for barn and country style interiors, because so much of country style relies on textures and natural materials. It’s much easier to envision how these components fit together if you can see and feel their weight and texture in person. That said, consider your general direction. Country style is so broad that there are dozens of design schemes to choose! An elegant French provincial would do well with whites and florals, or maybe a shabby chic for something more feminine. Rustic country could draw on exposed wood finishes and beams, or combine country with contemporary for a modern farmhouse and a subtle homage to countryside whimsy. Once you have a starting point, it’s time to delve into the details. Country and barn house styles rely heavily on natural wood textures and monochromatic color palettes, making your choice of colors and woods extremely important. Depending on the preexisting architecture and décor you’re working with, vivifying outdated wood is easier than you think. Distressed/weathered wood. Great for a timeless rustic or shabby chic look, distressed or weathered wood has been artificially treated to emulate weathering by the elements. If not already finished, you can easily preserve the unique look and color of your distressed wood by finishing its surface with a coat of polyurethane. Potential colors of distressed wood are diverse, but gray color palettes are very popular. Because the paint colors are meant to look uneven (versus a uniform coat), each distressed wood piece is truly one of a kind. Natural wood. Natural wood embraces the naturally occurring patterns, color varieties, and textures of wood, which all add character and charm. For a country theme, natural wood helps ground the overall interior in the desired nature theme. White paint paired with natural wood accents such as wood ceilings and hardwood floors is a classic country look that helps draw attention to the wood’s beauty. Monochromatic color palettes. Natural and exposed wood aren’t your only options. Painted finishes are also exceedingly popular in country style interiors. Aside from the classic barn red with white trim, monochromatic color palettes have taken center stage in farmhouse design. Use white as the predominant color and pair it with black accents for the shutters or fixtures for a high contrast look. White paint with black trim is also popular, as well as solid grays or solid whites. Lighting is an essential component of the bigger picture of your design scheme. Once you have colors mapped out, the appearance and placement of your light fixtures can bring the whole look together, both inside and out. The classic barn light typically consists of a curved gooseneck for the arm coupled with a wide-brimmed dome shade. Dozens of variations in style and size exist; that’s where Cocoweb can help you with your project. We offer customizable models of barn lights to make your design goals a reality. Barn lights are crowd-friendly. Though a classic farmhouse lighting look is to place a single barn light above a door (typically right at the center of a gable), barn lights work best in pairs or groups. Install them above your master bathroom mirror to complement your faucet duos, or flank your patio or garage doors with multiple lights. A matching set can enliven your porch or outdoor patio too by mounting one light on each porch beam. Endless silhouette options. The barn light is instantly recognized by its curved neck and wide shade, but countless variations exist and can give the light (and your home) a more classic or contemporary feel. A straight neck and smoother shade may look more modern, or add a refreshing but classic touch with a Victorian-style arm. The possibilities are endless! Don’t forget paint and metal finishes. Color has a dramatic effect on the overall appearance of your barn or farmhouse lights. A dark bronze or painted black may pair well with monochromatic color schemes or dark woods, while bright copper or white presents a lighter, airy feel. Our customizable selection at Cocoweb lets you mix and match colors and finishes to your heart’s content. Beyond colors, wood finishes, and lighting, you still have plenty of room to experiment with interior and exterior accents that help unify a country theme. Nature and other countryside motifs are the foundation for country styling, and that remains true in all the little details. Natural stone detailing. Including natural stone accents in your country interior is a foolproof way to enhance the country theme. Paired with white paint and natural wood finishes and furniture, stone makes a striking impression when used as an accent wall or fireplace finish. Flagstone, cobblestone, rusticated stone, or brick are all wonderful options, and can even be used as flooring. Exposed beams and rafters. Exposed wood is a ubiquitous detail in country style interiors. Exposed ceiling and wall beams contrast nicely against paint; even with matching wood finishes the texture stands out. Wood rafters also help emulate a barn look, and add a layer of depth to the room. Doors, siding, and x-beams. For another touch of detail, consider barn-style sliding doors, which add a truly unique accent to your home. X-beam sliding doors or x-beam cabinetry also helps enhance the farmhouse feel, while more textured accents like board and batten siding and walls adds additional visual interest. Country style interiors (and exteriors) are amazingly versatile. From classic to contemporary and everything in between, our suggestions are only the beginning of your design journey. No matter your design goals, let Cocoweb’s customizable barn lights finish your farmhouse look. All our lights are designed in-house to ensure a unique and high-quality product, so shop our barn lights today for the finishing touch on your country house project.